Arteries carry oxygen-rich blood from the heart to the rest of the body. Veins carry blood back up to the heart where its oxygen supply is replenished. Capillaries connect the veins and arteries to one another. When all is going well and the system is functioning at its most optimal level, blood is able to flow easily and get to where it needs to be, when it needs to be there. However, as is the case on any South Louisiana roadway, a single hiccup in the system can quickly lead to problems throughout. In the vascular system, these problems may be narrowing arteries due to atherosclerosis (plaque buildup) or blood clots which can impede blood flow the heart or brain. Ankle Brachial Index (ABI) – In the case of PAD, which primarily affects the legs, great insight can be gained from this simple test in which blood pressure taken at the ankle is compared to that taken at the arm. Ultrasound – Ultrasound techniques such as Doppler tests allow physicians to visualize and evaluate blood flow and identify any areas where it may be compromised. Angiography – Following the injection of a contrast dye, physicians can observe blood flow as it happens with the aid of x-ray, magnetic resonance angiography (MRA), or computerized tomography angiography (CTA). Once a diagnosis has been confirmed, there are a number of suggestions that your doctor may make for treatment. In some cases, lifestyle changes such as exercise, diet, and smoking cessation are impactful enough to avoid further intervention. These changes are often in conjunction with medication prescribed to help control contributing factors such as cholesterol or blood pressure or to prevent the development of blood clots. Balloon Angioplasty – A balloon is positioned in the affected artery via catheterization. 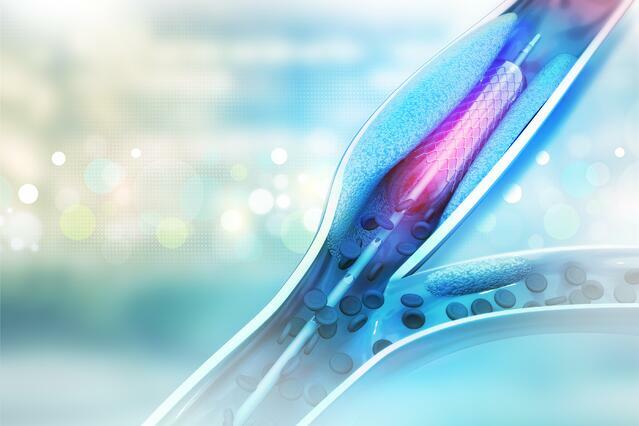 Stenting – A small, mesh support tube is placed in the area of blockage via catheterization to support blood flow. Atherectomy – Through a catheter, a special device equipped with a rotating blade is used to remove plaque from the diseased artery. Bypass – If a large section of the vascular symptom is impacted or if symptoms are particularly severe, bypass surgery may be necessary. Cardiovascular Institute of the South has earned a reputation for advanced treatment of vascular disease, particularly peripheral artery disease. The expertise of our physicians combined with innovative techniques and cutting edge technology has led our Lafayette PAD treatment center and others to become leaders in detection, treatment, and amputation prevention. Learn more about PAD and the regions where we offer PAD treatment by clicking below.